Like Adnan Januzaj’s lefty kick finding its way to the back of England’s net, the World Cup also turned a corner at the end of yesterday’s games. The weakest teams filtered out, the tournament now becomes a string of elimination games at slightly more reasonable hours (none earlier than 7 a.m.). 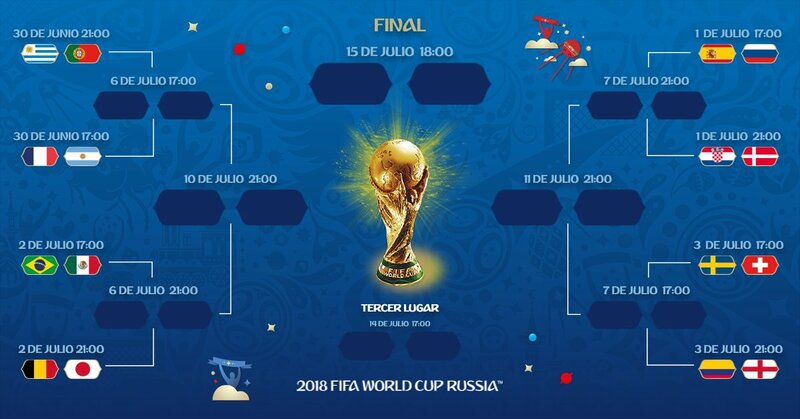 With fewer teams and fewer games to follow, you may find your World Cup-crazed coworkers struggling to figure out what to do with their newfound time, scrolling furiously as they try to freebase the ever-scarcer information trickling in from Russia. Life outside the screen may go back to its usual melancholy for hours at a time. As the field narrows, games are bound to become tighter and more dramatic. Inferior sides are bound to cling at a scoreless draw for as long as possible, which may prove an impossible riddle for the opposite team. Heads will explode should the game reach a penalty shootout, and you will want to be prepared for the moment when no one is capable of speaking about anything but fútbol. I know Messi and Cristiano. I’m good to go, right? Not quite. Although Argentina’s Lionel Messi and Portugal’s Cristiano Ronaldo are the best players in the world, their national teams are far from it. Ronaldo reached the semifinals in 2006, and led his team to the title at the 2016 Euros (although he was injured very early in the final). The 33-year-old arrived to Russia in great physical shape, and is expected to carry his side as far as he can, but an aging Portuguese defense could be his undoing. Messi, on the other hand, is always expected to lead Argentina to victory, despite his different personality type. Perhaps because he spent most of his life in the well-oiled Barcelona system, the 31-year-old is knocked off-kilter by disorder, which his own side provides in abundance. He did manage to show signs of life against Nigeria, and is an immense threat, even on a bad night. On Saturday, Argentina faces France (7 a.m.) and Portugal plays Uruguay (11 a.m.). Should both of their teams advance to the quarter-finals — far from a given — Messi and Ronaldo would face each other next Friday at 7 a.m. So who’s the favorite? I want to root for them. Although notable flopper Neymar hogs all the attention, it is Philippe Coutinho who has been silently leading his team from the midfield. Along with his creativity, Brazil has also been super consistent on defense. Despite an unconvincing start, the team seemed to turn a corner against Serbia. No more jogo bonito, though. Spain, on the other hand, was doing just fine until a day before the World Cup, when the federation fired the coach and promoted inexperienced Fernando Hierro. The pass-happy script mastered over the years, plus the great form of creator Isco and striker Diego Costa, put La Roja ahead in their group. But the fluidity is not quite there yet, and a loss of possession often leaves their center-backs high up and very exposed. What if I want to root for the dark horse? Being the hipster fan is a soccer standby. This year’s World Cup has been all over the place, though, and it is harder to read what is going to happen from one game to the next. Belgium and Croatia have been very consistent throughout the group stage, and could be to your liking in the elimination rounds. Americans are exposed to the Premier League much more than to any other country’s soccer, so consideration for England’s chances is pumped up accordingly. The English side in Russia is young and joyous — a rare sight. Their captain, Harry Kane, may be the best striker in the World Cup. But, given their history of meltdowns and despair, it may be too early to tell. Video replay seems to be causing all sorts of trouble, huh? TOLD YA. Very much so. The long-awaited arrival of Video Assistant Referees (VAR) was always going to be controversial; plenty of fans seemed to think injustice was just another part of the sport’s “folklore.” But even for those who don’t think that way, it has been so confusing. VAR has uncovered blatant flops and handballs in the box, and has clarified very evident offsides. Sadly, the technology is still in hands of the refs, and the decision depends on their criteria. And refs can still be swayed by a whisper over their shoulder before the game. (Not that we have seen anything, though). If any game is tied after 90 minutes, the teams will play two more halves, of 15 minutes each. Although players are in great shape, extra time can be a lengthy agony for everyone involved. Even worse? Trying to shoot a penalty with aplomb after all of that. Penalty shootouts tend to go to the “best of five.” Nerves and exhaustion tend to result in at least one failed shot, if not the skill of the goalie. (Prepare your tissues). If the teams are still tied by then, additional rounds of one kick are used to break it, in what is called “sudden death.” This puts even more pressure on the team who kicks last. The importance of winning a coin toss! Unless they were already suspended for accumulation, players carry their group-stage yellow cards to the knockout stage. If anyone gets a second, they are out of the next game. Yellow cards are only expunged from one’s record before semifinals. Being the best of your team does not make you the best penalty shooter when all of the thoughts are eating your brain. Both Messi and Ronaldo have already missed a penalty in this World Cup. Those two Swiss players doing las palomitas with their hands the other day? They were actually Albano-Kosovar refugees protesting Serbia’s ways. What a thing, mixing sports and politics, huh? Did you watch “Icarus”? That doping scheme was said to be running in soccer, too. The funny doctor from the documentary even recognized an unnamed Russian player as one of his own. Uruguay always plays like the underdog, but they are actually two-time world champions, and are historically the best team in South America. A country of three million people! How does that happen? Colombian soccer players are such great dancers because salsa is everywhere in the country: in the club, in the streets, blasting out of the shops, even in the pool. It is an activity of the masses. The attention to the women’s version of ANYTHING is never as big as for the men’s World Cup. It doesn’t have to be like this. May I refer you to this video? Most bars and canteens are opening earlier than normal to show the games and sell some food. You can see them on the map below. As always, let us know how you’re enjoying this crazy World Cup, and send your tips to info@missionlocal.com.